Place sliced bread in single layer on baking sheet. Drizzle 2 tablespoons of olive oil over bread, and sprinkle 2 teaspoons of Tony Chachere’s Original Creole Seasoning over bread. Place in oven and bake until slightly browned, about 8-10 minutes. Remove and let cool. Remove feta cheese from brine, and place in an over proof baking dish. 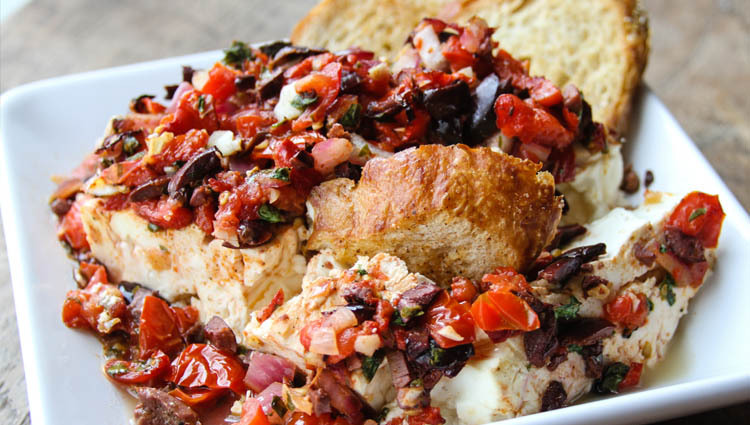 In a medium size bowl, add tomatoes, red onion, Kalamata olives, garlic cloves and parsley, and stir until combined. Drizzle in 2 teaspoons of olive oil, remaining 2 teaspoons of creole seasoning, and stir. Top the feta cheese with vegetable mixture, and bake uncovered for 20 minutes. Remove from oven and immediately drizzle with remaining olive oil and balsamic glaze. Serve with Tony Chachere’s toasted baguette or pita.